A great soccer keeper drill for your goalie with this hard working drill. Quick recovery and positioning is important to have success in this. - Set this keeper drill up with 2 shooters roughly 15-20 yards on either side of a goal, 1 goalie in goal. - Outer players take turns shooting as the goalie must quickly recover to their feet, turn and prepare for the next shot. 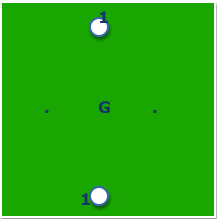 - After a save goalie should throw ball back to shooter (have extra balls ready). - This should be very tiring for the goalie so 60 seconds should be enough. - Allow a 45-60 second recovery and repeat, or rotate through another goalie. - Goalie should be well balanced and prepared for every shot. - Goalie must recover as quick as possible, turn and be ready for next shot. - Shots should be varied. - The quicker the shots are alternated the harder work for the goalie. - 5-10 minutes for this soccer keeper drill.